Aronson, R. B., P. J. Edmunds, W. F. Precht, D. W. Swanson and D. R. Levitan. 1994. Large-scale, long-term monitoring of Caribbean coral reefs: simple, quick, inexpensive techniques. Atoll Research Bulletin 421:1-19. Cervino, J., R. Weeks, J. Shorr, C. Lin, D. Gjoza, and T.J. Goreau, 2012. 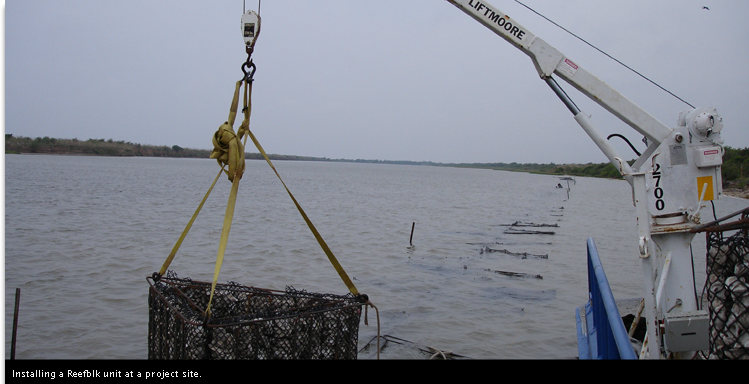 Electrical restoration of oysters and saltmarsh at a New York City estuarine wetland. Abstract, ICSR 2012, Mystic, CT.
Goreau, T.J. and R.K. Trench, Editors, 2013. Innovative Methods of Marine Ecosystem Restoration, 312p., CRC Press, Boca Raton, FL (several chapters also in volume on oysters specifically). Gulf Coast Prairie LCC has started shallow-water (intertidal) oyster reef mapping using drones and side scan sonar (see links) https://gulfcoastprairielcc.org/science/science-projects/shallow-water-intertidal-oyster-reef-mapping/ and https://www.sciencebase.gov/depth/#/show/55c37fb7e4b033ef52106bda, and https://www.youtube.com/watch?v=QEv2zBxdkB4. Source for aerial film drones (drones, remotes, copters, etc.) equipment and aerial film-making specialists. For comparison of entry level Phantom 3 & 4 drones by DSLRPros see link. Currently decent drones can be had for $400 and up with a lot of used ones on eBay with accessories for a lot less. Epoxy Rock Repairs for Exhibits, etc. By Jim McAlister, The Georgia Aquarium Inc.
Population sampling (e.g., oysters, clams, snails, crustaceans) can entail measuring tens to hundreds of thousands of individuals annually. Prior to 2001, our standard procedure was to measure oysters with dial calipers to the nearest 1 mm or 0.1 mm, calling out the measurements to a scribe who then recorded a data point from each of one to four individuals, each measuring simultaneously. After completing a sample, these data were entered into a PC (e.g., Access database or Excel, software dependent) by one person and then proofed against the handwritten copy by two others prior to data analysis. The process was time-consuming and fraught with errors. Data proofing often revealed the omission of entire columns of data. Also, the scribe could enter dictated numbers incorrectly. In 2001, we purchased and utilized a digital system with induction calipers and other cabling, etc. from Fowler, Inc. We used an Access database designed for a specific project’s requirements. It incorporates ‘input masks’, which are defined ‘field sizes’ and ‘validation rules’ to make entry easier and less error-prone. Not only is the system much faster than the manual method but it eliminates many steps where common errors were encountered previously. The time savings is so significant that the system has paid for itself in less than one year! A list of units of measure, surveying terms, surveyors’ slang and abbreviations, water descriptions, etc. 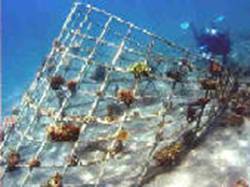 The first reef made from FL material was deployed in 2007. Use mined shells and they developed a patented process to embed the material rock into concrete surface. The patented design provides cave-like habitat for grouper as well as other species and it the tallest artificial reef on the market (@8′ tall). The reef structure is a rebar frame with 276′ of it inside the 6,000 lb. structure. It has a 10′ footprint to prevent settling/scouring and to withstand storm events. The limestone rock increases surface area. 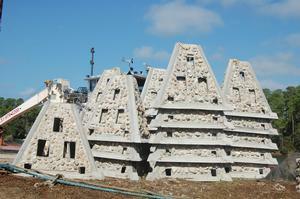 See their video section and then “Florida Limestone” for more information. ReefBLK℠ is a system to construct living shorelines generally in areas with high wave energy. Through time the structures become living reefs that provide a habitat for a large variety of organisms. The structures accumulate new shell eventually washes ashore. The ReefBLK℠ technique results in more rapid formation of reefs than through planting loose or bagged material with lower relief. They can be used anywhere oyster will grow, along the shores of lakes and bays, around islands, and along the banks of streams and canals. The ReefBLK℠ system is patented. It was developed with the support of a team of experienced scientists and it has been proven through successful installation in coastal waters. ORA Technologies provides innovative products and services for engineering and environmental needs in the coastal environment. Their first product, the Oysterbreak, was developed to slow coastal erosion and enhancement of associated reef communities. The OysterBreakTM is a patented technology developed by ORA Technologies designed to encourage oyster settlement. The OysterBreakTM system’s design is to be used as an alternative to traditional riprap deployment. The OysterBreakTM units are composed of OysterKrete®, which is a marine grade cement-based material designed to provide a suitable surface for oyster growth. OysterBreakTM units are designed to encourage reef formation for both habitat and shoreline protection. The individual units interlock to create a complex reef structure. The OysterBreakTM is designed to maximize stability during storm events while reducing sinking on soft bottoms often found in estuaries. Over time, oysters fill in the OysterBreak™ creating a near continuous reef. The OysterBreak™ reef is designed based on local hydrodynamic and geotechnical conditions to be stable. The configuration of the OysterBreakTM units are supposed to reduce sinking in soft sediments vs. rock deployments. They state that the primary performance criterion for shoreline protection is the hydrodynamic interaction of the OysterBreak with the shoreline (i.e. overtopping, transmission, and diffraction). Other criteria include: geotechnical stability, individual unit stability, individual unit structural capacity, and overall structural stability. The OysterBreak™ is constructed of interlocking rings which can be stacked in a wide range of configurations. The ring design allows for flexibility in configuration, while maximizing empty space. Over time, oysters fill in the empty spaces creating a continuous structure. Use of the OysterBreak™ and OysterKrete® technologies is exclusively licensed to Wayfarer Environmental Technologies (WET, see http://wayfarertech.com/). WET is currently building an OysterBreak™ project to protect the shoreline of the Rainey Wildlife Refuge in Kaplan, LA. 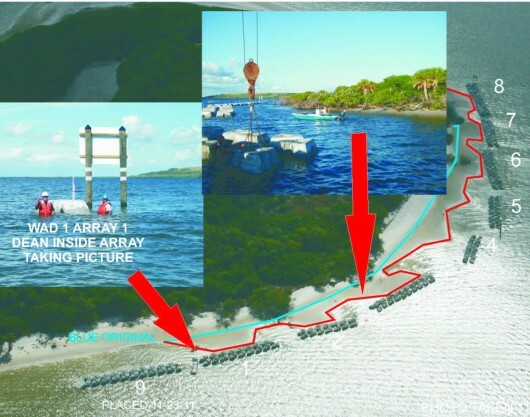 The project, located in Hell Hole Bay, consists of 350 OysterBreak™ rings in two configurations. Using local contractors and unique equipment, WET deployed the rings in 2.5’ of water with no dredging and no impacts to existing oyster bottom resources. The site is a state oyster seed ground so access dredging would require costly restoration. 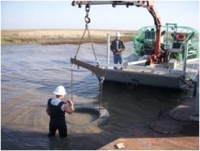 They used airboat mounted equipment to reach shallow areas (see http://wayfarertech.com/projects/vermilion-bay). The project is funded by the Nature Conservancy, who is also funding scientific monitoring of the structures. Attenuating Device (WAD) and the oysters that recruited on our Audubon project on Alafia River to protect island from eroding. For more information contact: Jim Anderson, 3941 24th St. SE, Ruskin, FL 33570, 813-918-7373 mobile, janderson@livingshorelinesolutions.com or halodule@aol.com. Once assembled, this kit — developed by community researchers from the Public Laboratory for Open Technology and Science — enables you to collect your own aerial photos from up to 1000 ft. Using the open source MapKnitter web-based software, you can stitch the resulting images into a web-viewable map — your own “counter-cartography” Google Maps. It was used to map the BP oil spill and has been used to document wetlands loss. Protective leather-palm cotton gloves for handling the line. Thin line can cause burns to unprotected hands. Coyer, J.A., D. Stellar and J.D. Witman, 2011. The underwater catalog : a guide to methods in underwater research, 3rd Edition, 122pp. Order through Shoals Marine Lab, http://www.sml.cornell.edu/sml_research_publications.html, Email: shoals-lab-east@cornell.edu to buy a copy. The third edition (2012 edition) of the book is available for $30.00 (US Funds per copy), including shipping costs within the contiguous US.